Tbilisi is the capital of Georgia. I created a special page for this city because it is where my heart is at all times because I was born and raised in Tbilisi. This City of Roses, as people call it, was said to be founded on the natural hot spring reservoir. According to an ancient legend, in the fifth century A.D., the king of Georgia Vakhtang Gorgasali went hunting in the woods. He shot a deer with an arrow. The wounded deer fell in the hot water spring nearby. In few minutes, the deer jumped out of the water unexpectedly and ran away as if it had no wounds at all. The king ordered his servants to examine the hot spring. The servant went to fulfill the kings order and concluded that the natural spring had healing power that could cure even the severe wounds. After King Vakhtang learned about this discovery, he decided to build a city in that area. 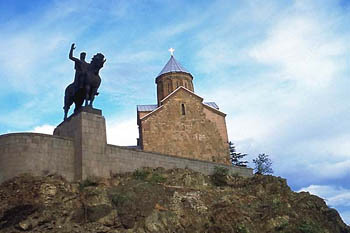 Since "tbili" means warm in Georgian, the king decided to name the city Tbilisi. 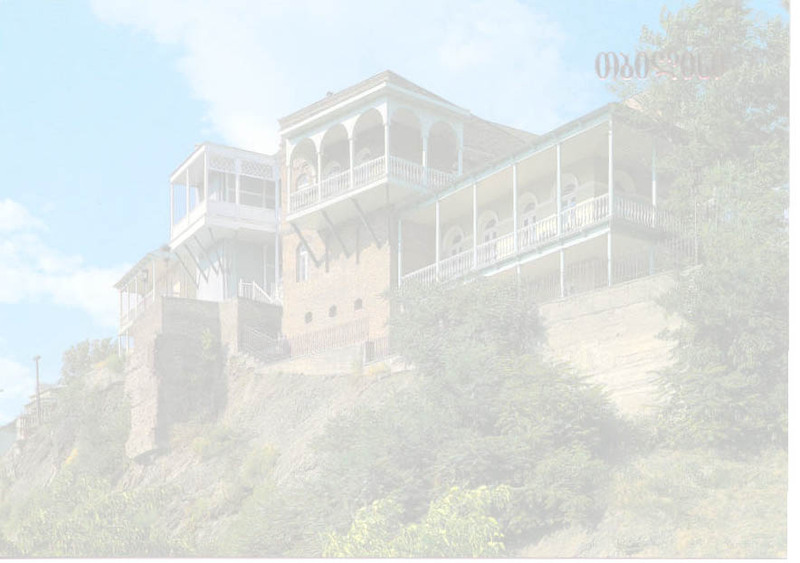 Even today, one will find famous warm water baths in the older part of Tbilisi, right along the Mtkvari (Kura) river. Tbilisi started out as a small town, but soon Georgian Kings relocated the capital of Georgia from Mtskheta to Tbilisi. Today, Tbilisi is one of the largest cities in Georgia (click here to view the map of Tbilisi) with the population of about 1.5 to 2 million people. The city is not distinguished by 100 story skyscrapers or huge sea ports, although Georgia does have large sea ports along the Black Sea. On the contrary, it is distinguished by its antiquity, the mixture of old and modern architecture, and warm, enthusiastic and hospitable people. 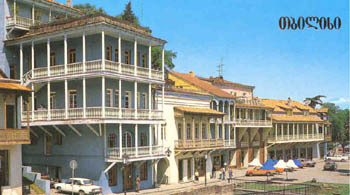 It is a beautiful city distinguished by the statues and monuments of famous Georgian kings, poets, writers and artists. Furthermore, there are many small street cafes, and numerous museums, theatres, and concert halls. Universities are also part of the city. Thus, you can guess that life in Tbilisi is never boring. It is true that during the past ten years, the city went through destruction and number of wars, but slowly the city is being rebuilt and looks even more beautiful than before.